Early this morning, we wrote about the surprise appearance of a Pokémon game on Apple's iOS storefront. Y'know, the one that's apparently a broken scam? 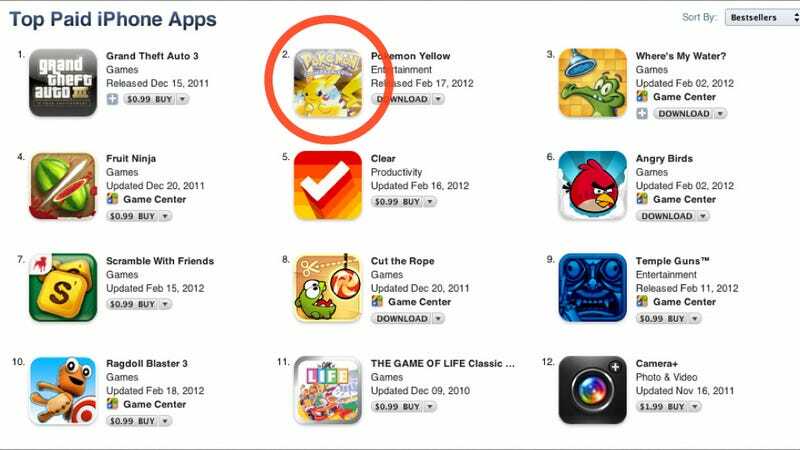 Despite that, developer QEAB's Pokemon Yellow is sitting at #2 on the App Store's Paid Apps chart, right behind the fully-functional and actually-pretty-good Grand Theft Auto III. If you are experiencing issues with Pokémon Yellow, we sincerely apologise for any inconvenience. Thanks for your patience while we thoroughly investigate this issue. We are working on a new build and we anticipate this will be completed soon, which should overcome the issue. Kotaku's reaching out to Nintendo and Apple for comment about this Pokémon Yellow situation.